It won’t be here for a couple of mouths, but feline flick enthusiasts (us included) are already foaming at the mouth in excitement over the 1-2-3-DONE tool. A pen-shaped stamp with a rubber wing at the end, you just dip it into a creamy gel pot, line it up to the outer corner of the eye, and stamp it on for a picture-perfect wing. So I bet you’re wondering why didn’t I think of this first? Well, the fact of the matter is that its creator, celebrity makeup artist Veronica Lorenz, is always one step ahead of the game–she’s a co-creator of THE Beautyblender after all. But The Vamp Stamp goes far beyond just being a brilliant hack. Lorenz was inspired to create it after being diagnosed with a benign tumor that causes partial paralysis, which made it so that she was unable to do makeup with her right hand. Considering what a career lifeline it presented, Lorenz’s latest is a game-changer in the truest sense of the word. There’s no official word on how many months we have to wait for The Vamp Stamp, but stay tuned because we’re not psychic or anything, but we can already tell these stamps are going to sell like hot cakes. While stars like Alexa Chung and Adele are rarely seen without their signature perfectly winged eyeliner, when it comes to recreating the look at home we usually don’t get quite as impressive results. The combination of trying to achieve the perfect flick, smooth lines and making it even on both eyes is a beauty challenge that often defeats us, but not for much longer thanks to an amazing new creation called The Vamp Stamp. An ingenious creation, this eyeliner pen works like a stamp which you simply press against your eye for a flawless winged effect. There are two different size stamps on offer, which come with a pen at both ends so users can ensure their flicks match and perfect the finished look. 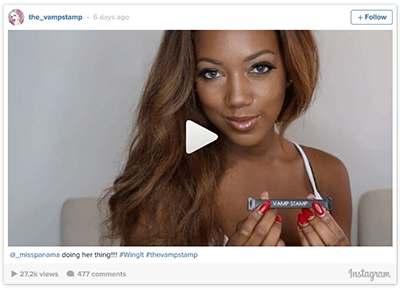 Sadly the Vamp Stamp is not yet available in stores, but the beauty brand has already attracted close to 22,000 followers who have been impressed by the videos demonstrating the stamp at work. We can’t wait to get our hands on this! Crafting the perfect cat eye takes time . . . time that many women don’t have. In the morning before work, who has the patience to correct smudges, uneven wings, and shaky lines? However, a promising new beauty tool seems like the solution to all your cat-eye issues. The Vamp Stamp is a double-sided eyeliner marker. Either end features razor-sharp wing “stamps” (one for your left eye, one for your right) that you can just press against the outer corner to create a flawless cat eye. It will also be available in two different sizes, presumably so you can choose between a more subtle “kitten eye” or a more dramatic wing. 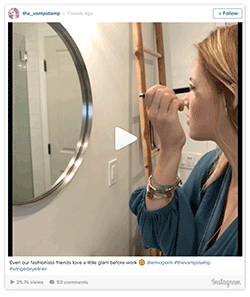 The brand told POPSUGAR via email that The Vamp Stamp will be available in two to three months, but in the meantime, we’re completely mesmerized by the Instagram videos demonstrating how the product works. Stay tuned for more information as it becomes available! 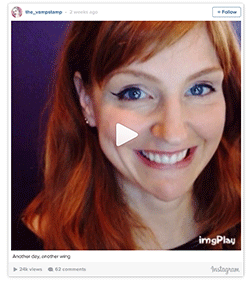 No more deep breaths before applying your eyeliner, friends. There’s a new tool coming out that’s about to change your cat-eye game. Possibly for good. The cheekily named Vamp Stamp is a double-ended (so you get two size options), V-shaped stamp that fits into the corners of your eyes. The stamp is dipped into your favorite pot of liner, placed at the outer corner of your eye (where you want your wing), and then pressed down onto your skin. And just like that, you’re wingin’ it like a pro. There’s also a really beautiful story behind Vamp Stamp. 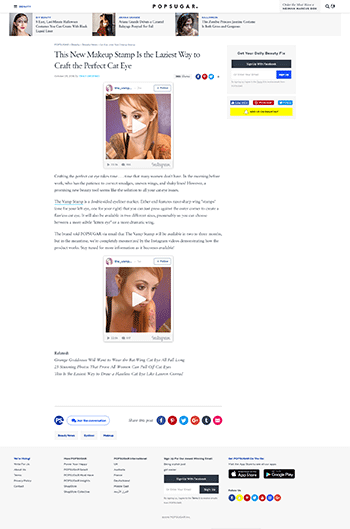 We spoke to the Vamp Stamp team and they told The Huffington Post that the tool was created by celebrity makeup artist Veronica Lorenz (who also founded the iconic Beautyblender!) after she was diagnosed with a benign cervical tumor and slowly became unable to do makeup with her right hand due to the partial paralysis the tumor caused. The tumor eventually impacted her left hand as well, leaving Lorenz to get creative in order to apply makeup more effectively and efficiently. accomplish in seconds, no skill required,” the Vamp Stamp team told us. Some people use tape, others create a triangle and fill it in like a little diagram. 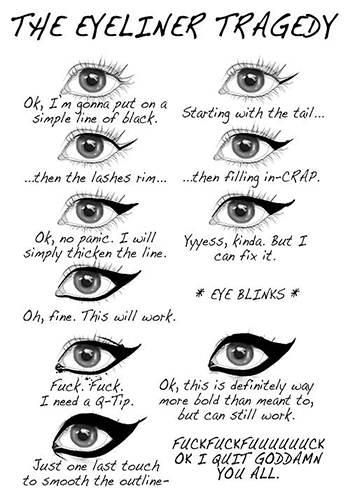 The cat-eye struggles are really, really real. Well, the Vamp Stamp is now here to help you get a clean, even line on both eyes, at that perfect angle that’s so hard to do perfectly when you’re not a makeup artist. Well, the Vamp Stamp isn’t here yet, but based on some Instagram stalking we’ve done, we’re really excited to try it. The tool is literally a stamp that helps you create a perfectly even cat eye every time. If this little beauty tool does what it says it does (and it seems like that’s the case so far), it’s going to be a game changer. We haven’t tried it out yet, but we’re banking on this being the kind of tool we can’t believe we’ve lived without. 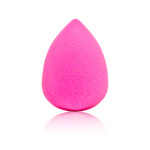 That’s because it’s the brainchild of Veronica Lorenz, co-creator of the Beautyblender Original makeup sponge. And we know how life-changing that sponge is. 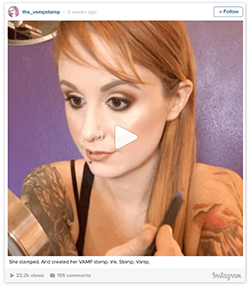 A spokesperson for the Vamp Stamp tells us that Lorenz’s inspiration for the tool wasn’t just her signature winged eyeliner but really the fact that she was diagnosed with a benign tumor on her spinal cord and lost partial use of her hands. 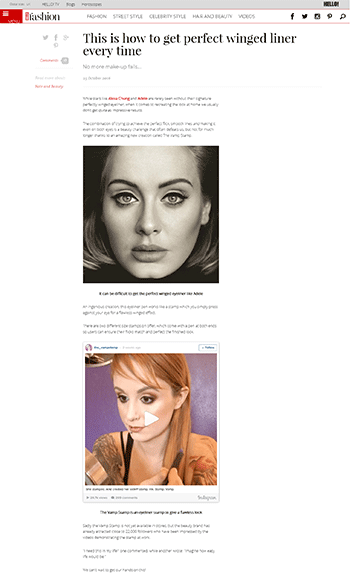 She created a product that would allow her to continue working as a TV and film makeup artist. With the launch of this tool, people with physical handicaps can easily get that crisp cat-eye look much easier. And it’s ridiculously easy to use. The struggle to create perfect winged eyeliner is real, but The Vamp Stamp just might solve all of our cat-eye problems. The stamp looks like something from a late-night infomercial. You know the products that promise to change your life but end up being useless? But from what we can see, The Vamp Stamp is legit. And a handful of beauty gurus are already putting it to good use. So how does it work? It’s just like an arts-and-crafts stamp, except it’s safe to put on your face. 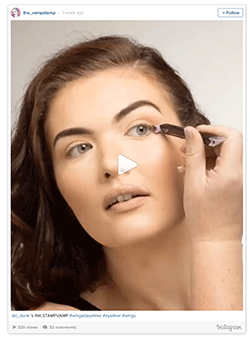 You just press the flat tool where you want your wing, and voilà—a perfect cat eye. There’s no need to go over the line multiple times because one tap leaves behind a bold, pigmented color. Yeah, it’s that easy. The only not-so-good news is that The Vamp Stamp isn’t for sale just yet. The brand’s Instagram page says it will be available “soon.” Our only question: How soon is soon? Because we need this, like, yesterday. Scroll down to see The Vamp Stamp in action. 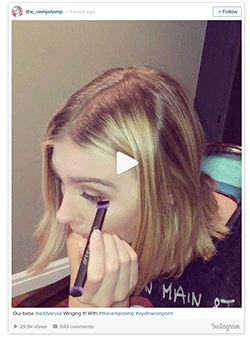 Here’s how you can use The Vamp Stamp to create a bold cat eye. And you can use it to get a thin wing, too. And here’s another vampy look. 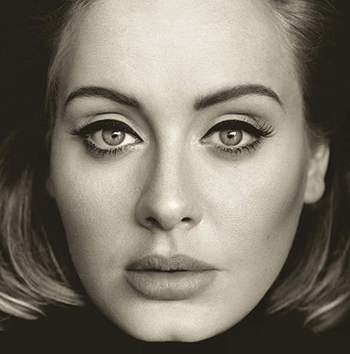 You no longer have to wing your winged liner. You know when you’re waiting in line at Bed, Bath & Beyond and notice at least 10 things you didn’t even know existed but knew they’d instantly change your life? That’s how I feel about The Vamp Stamp’s invention of a stamped winged liner, which I learned about through HelloGiggles. Here’s another test case! Just look at how easy it is! And one more in case you can’t believe your eyes! The only down side is it’s not out yet. Even though the brand’s Instagram says it’s out “Soon  ,” it really can’t come soon enough. 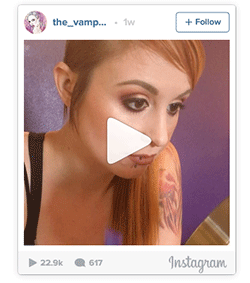 All that’s left to do now is watch Vamp Stamp’s Insta for updates. Cat eye to die (for). Beauty buffs, your cat-eye prayers may have just been answered. 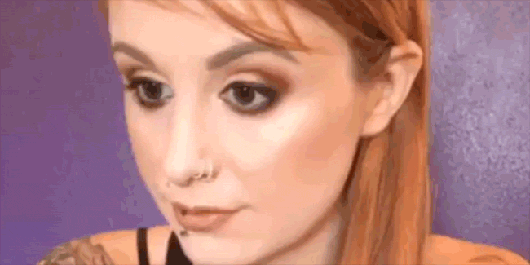 Indie beauty brand Vamp Stamp is advertising a “makeup stamp” that claims to perfect your winged eyeliner with an incredibly simple one-handed hack. The not-yet-released product is shown to be an inky pen that you press against the corner of your eye for an instant winged look. Vamp Stamp promises no more shaky, lopsided lines, thanks to its dual-sided pen, with each end tailored to an eye, HelloGiggles reports. The stamp will also reportedly be available in two sizes so you can customize your cat eye, the brand explains on Instagram. 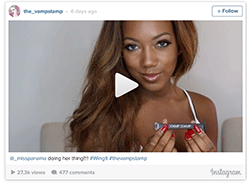 Vamp Stamp’s website is still under construction, but it’s shared several videos of the product in use to its Instagram and Facebook. The brand also says the product will be available in two to three months, but pricing info has not yet been released. So you’ve been working hard in the gym to get your arms, legs and abs ready for swimsuit season—but is your skin summer-ready? The good news is that achieving a beach-ready complexion isn’t as hard as you think. All it takes are a few skin care products—and some clever tricks—to achieve the skin of your dreams this summer. Exfoliating dull winter skin is key to achieving an enviable summer glow. There are a couple of routes to take here, depending on your preference and skin type. If you’re a fan of physical exfoliants or scrubs, one of my favorites for the body is CARITA Preparing Contour Scrub. This product features caffeine and hydrating oils that buff even the most ashen elbows to a shine. Another favorite of mine is Kai Body Polish. Nothing beats the gardenia-inspired sugar-and-salt combo. If, like me, you prefer acid-based exfoliants, there are a lot to choose from: glycolic acid for almost all skin types; salicylic acid for acne-prone skin; trichloroacetic acid for anti-aging; azeleic acid for rosacea-prone and hyperpigmented skin; and lactic acid or malic acid for sensitive skin types. Keep in mind that the goal of exfoliation is to cleanse and soften the skin, not to irritate, so if you are on the sensitive side I recommend a gentle scrub like Avène Akerat Smoothing Exfoliating Cream. 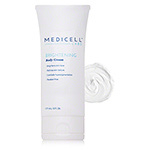 This is especially helpful for evening out dry, blotchy skin. Once you’ve properly exfoliated, slather on your favorite go-to body moisturizer. This is important if your skin is on the dry side and needs an extra boost of hydration, but I personally get the best results by applying self-tanner immediately. If you do want to hydrate first, give your moisturizer ample time to absorb (watching an episode of your favorite show should do it). One of the first tricks of the trade I learned was the value of a subtle bronze glow. 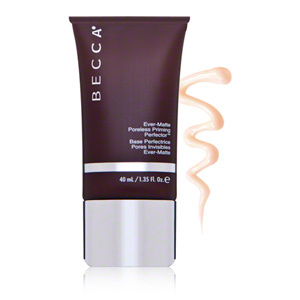 The effect creates a youthful, slimming look that works on virtually any skin tone. If you’re new to self-tanning, you have a few options, such as gels and lotions. But if you want a streak-free application, I recommend using a light mousse. Makeup Expert Tip: Did you know you can use your bronzer as an eye shadow? Keep the eye color light, and don’t forget to accent your décolletage. Another trick of the trade? Take your favorite loose bronzer or highlighter and mix it with baby oil gel. Apply this concoction to your body to get a gorgeous glow! To avoid washing off your tan, keep showers brief and not too hot. After your bath, let your skin air-dry or gently pat it with a towel. Then apply a tan-extending moisturizer like Tahitian Tan Extender by South Seas. If you plan to go for a swim, be sure to apply a water-resistant lotion with SPF. After a week, exfoliate your skin to give it a fresh go. If left for too long, your tan can look splotchy—like you forgot to bathe. 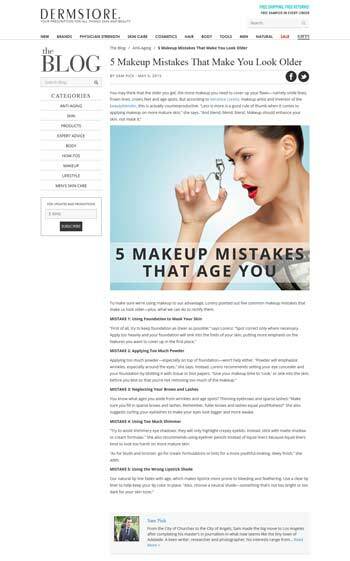 To make sure we’re using makeup to our advantage, Lorenz pointed out five common makeup mistakes that make us look older—plus, what we can do to rectify them. 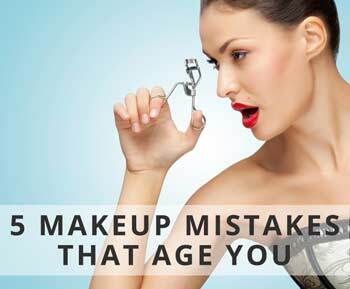 You know what ages you aside from wrinkles and age spots? Thinning eyebrows and sparse lashes! 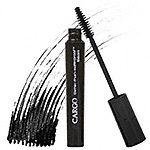 “Make sure you fill in sparse brows and lashes. Remember, fuller brows and lashes equal youthfulness!” She also suggests curling your eyelashes to make your eyes look bigger and more awake. “Try to avoid shimmery eye shadows; they will only highlight crepey eyelids. Instead, stick with matte shadow or cream formulas.” She also recommends using eyeliner pencils instead of liquid liners because liquid liners tend to look too harsh on more mature skin. 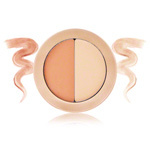 “As for blush and bronzer, go for cream formulations or tints for a more youthful-looking, dewy finish,” she adds. With so many fun fashion and beauty trends to try this spring, the last thing you want is a red nose and a pair of puffy eyes. Here, makeup artist and Beautyblender creator Veronica Lorenz gives us a few easy tricks to mask those pesky spring allergy symptoms! 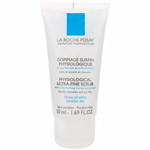 Physiological Ultra-Fine Scrub by La Roche-Posay. For dry and scaly skin around the nose, exfoliate and moisturize. For a weekly exfoliation, I like Physiological Ultra-Fine Scrub by La Roche-Posay. FOR YOUR SKIN If your skin is red, add a little cortisol cream to your moisturizer. This is safe to use around the eyes but not a routine you should follow on a regular basis. You can also mix the cortisone cream with your Kevin Aucoin Skin Enhancer. A hot date, check. Dinner reservations, check. A killer outfit, check. A head-turning, drool-inducing makeup look to match? Hmm…didn’t think of that, did you? Don’t worry! Here, Veronica Lorenz, makeup artist and creator of the innovative and much-loved BeautyBlender, gives you 5 celebrity-inspired makeup looks—and some easy tricks to recreate them—to get you primped and pretty on Valentine’s Day.